In my case, Thunderbird is running on a Mac Pro with 8 cores and 26GB of ram – so the problem was not system resources… it was something else. Here is Ian’s post in it’s entirety. You can jump to the comments to his post here. If this helps you, send Ian your thanks! 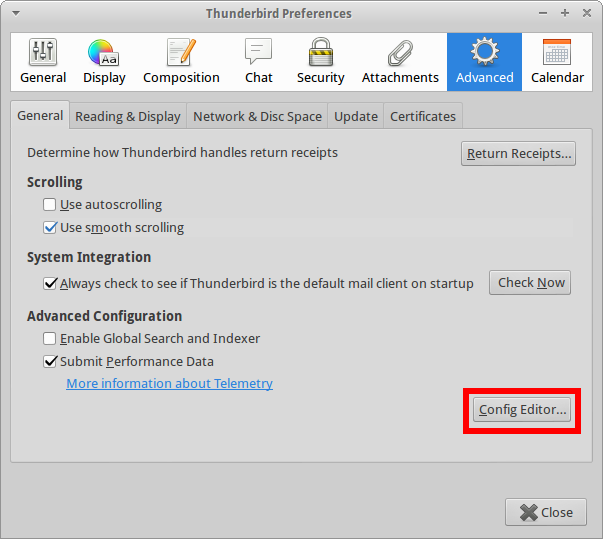 “My mail client of choice is Thunderbird. It’s always served me well, but recently I’ve noticed that my laptop’s battery life is abysmal when it’s running. A bit of poking reveals that it’s a real CPU hog if you have large mail folders (and I never delete anything!). Finally I found this bug report which has a working solution. It makes Thunderbird 17.0.2 much more gentle on the CPU, and according to the report, should work from version 15 onwards. Perhaps they’ll fix this by default eventually, but for now here’s a quick step-by-step on how to fix the problem yourself. “From the Edit menu, select Preferences (for later versions, select Options from the Tools menu). Click the Advanced tab at the top, then choose Config Editor. “There will be a dire warning, which you can safely ignore. You’ll then be presented with the configuration editor. Type idle into the search box, and look for mail.db.idle_limit. 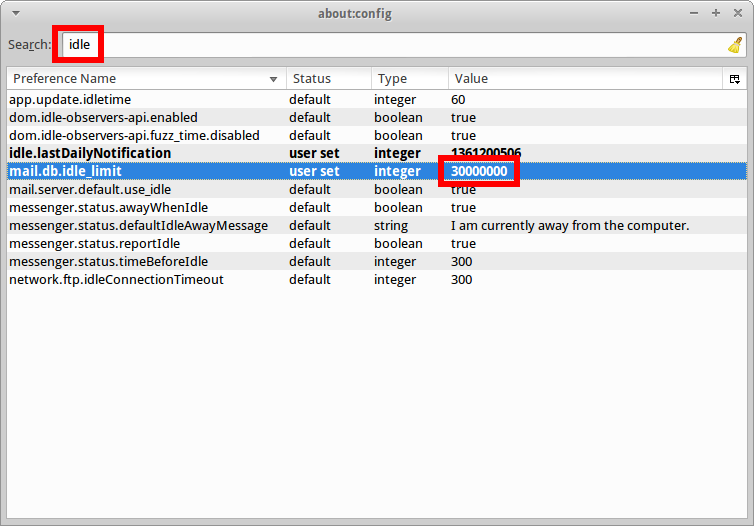 According to that bug report, the correct value is 30000000. Check the number of zeros you have; if you only have 300000, that could be causing your CPU problems. “That’s it! You don’t have to restart Thunderbird to activate the change, and you should see an immediate improvement in its CPU usage. Mine dropped from 60-100% down to <1%.